When is McDonald’s Good For You? 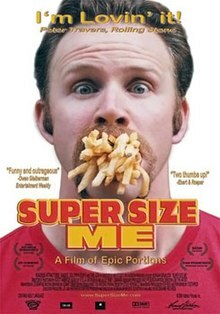 Morgan Spurlock, the director of the documentary Super Size Me, spent an entire month with a self-imposed rule of only being allowed to consume what is on the McDonald’s menu. If water is wasn’t on the menu, for example, then he couldn’t have water. He is monitored throughout the month by a doctor, and the entire process is filmed for posterity, and the production of the documentary. His main purpose in creating this work was to illustrate the adverse health effects of consuming the food from McDonald’s, especially on a regular basis. Throughout the documentary, we see him gaining weight, and becoming progressively burdened by many health issues. He ends up producing a very vivid and visual illustration of the negative consequences of consuming a diet made up exclusively of McDonald’s food. While this documentary succeeds in its vivid portrayal of these health issues from McDonald’s, there is another very interesting point which I take myself from a Heilkunst perspective. The whole idea of gaining a strong degree of knowledge about something through direct participatory experience, is central to the fundamental method within Heilkunst of determining the exact curative properties of any given medicine. This is what Dr. Hahnemann originally called a” proving”. Before Dr. Hahnemann created his medical system, the whole history of Western medicine preceding him had systematically avoided the use of the law of similars. Although the law of similars is the law of cure of disease in nature, it is, in fact, so powerful that it can also kill when the medicine is given in a crude dose. Once Dr. Hahnemann discovered a safe way to overcome this danger of using similars, (by using potentized medicines), he then had to tackle the next issue which was to determine in a consistent and scientific way the exact properties of each medicine, in order to know exactly which medicine would be similar to which disease. He solved this problem by inventing the method of doing a “proving”. A ‘proving’, within Dr. Hahnemann’s system, is the conscious ingestion of a given substance by a group of healthy individuals, who then record in great detail all the symptoms, sensations, and functional changes that they experienced. This method reveals a composite image of the medicine in all of its manifestations — from different bodily regions and systems, to mental and emotional functions. This makes the practical use of the law of similars straightforward, as these proven remedy images are now matchable to the living disease image of the patient in the clinic. This method created a way of determining the inner content of a remedy (and therefore disease), and raises it up to a level of objective knowledge which then becomes useful in a collective sense. This as opposed to any number of experiences we have throughout our life which we just passed through, without extracting any meaning. In a sense then, this movie is an example of the director doing a form of a proving on himself – that is, he conducting a proving of McDonald’s. Provings can be done at a number of different levels. The doctor, for example, does a “proving” of the patient, when they are taking in a complete impression of the whole patient, and then converting this into an accurate image from which to prescribe the correct similar remedy. This method illustrates how Heilkunst practices a form of “science of quality”, and “science of the interior” — the proving reveals an objective image of the inner essence of something, rather than the outer material form. Spurlock’s Super Size Me also recalls the Heilkunst concept of ‘tonic regimen’ which we’ll explore in an upcoming blog post.